Are you sick and tired of cleaning your gutters? Or are your gutters leaking or sagging? All of these issues and more can be solved by installing gutter guards with MasterShield Gutter Guards. 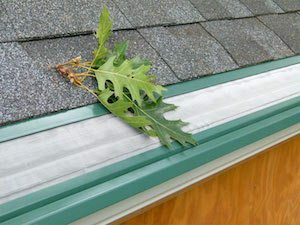 Gutter guards are a protective covering placed over the gutter that allows water to enter but blocks leaves, twigs, and other debris. Installing gutter guards is a "once-and-done" upgrade that will protect your home from all kinds of moisture damage. With MasterShield gutter guards, you get the benefit of a thin yet very strong aluminum frame. These gutter guards easily conform to all of the imperfections often found with your existing gutters, including wavy fascia boards or warped subroofs, allowing for the ultimate gutter guard performance. If you're interested in gutter guard installation for your home, call us today at 1-844-385-9370 or contact us online to get started with an inspection and estimate. We offer free estimates on all our services in Woodbridge, Manassas, Alexandria and the nearby areas. The gutters on this Chevy Chase, MD home were packed full of debris. We cleaned the system out and installed MasterShield. They will now never have a spec of debris in their gutter system and will never have to clean them again. We replaced this homeowner's old copper gutters with brand new ones. Then we installed MasterShield panels on the entire system. Now they will never have to worry about cleaning their gutters ever again. We installed MasterShield on the gutters of this home in Laurel, MD to permanently prevent clogging by large leaves. We installed MasterShield gutter guards on this home in Ellicott City, MD so the gutters will never get clogged by nearby trees again. This family wanted to protect their gutters from clogs caused by nearby large trees. To prevent this from happening, we installed MasterShield panels on their existing gutters, and now they won't have to worry about the clogging anymore. This home in Edgewater, MD had gutters that were clogged with leaves from nearby trees. We cleaned out the gutters and covered them with MasterShield panels so they will never get clogged again. "It was an Angie's List Big Deal that we purchased. It..."
"They came on date promised and did a great job cleaning our..."
"Exactly as expected, without a problem. Description..."
"Description of work: I had gutter covers installed. My..."
"Description of work: I wasn't at home when the shields..."
"Installed gutter guards over existing gutters on very high..."
"Description of work: The estimate was more than I hoped..."
"The estimate and installation was very professional and..."
"Work was completed on time, efficiently and neatly. The..."
Why choose MasterShield Gutter Guards for your gutter guard needs? An up-close look at our HydroVortex Technology. When you work with MasterShield Gutter Guards, we can install a system that works in tandem with the existing pitch of your roof. Part of the reason our gutter guards are so flexible is because of our use of Hydrovortex Technology. This technology makes it so that the gutter protection can be installed at an angle and be very effective. While water can often overshoot other products, our Hydrovortex Technology is designed to overcome this natural inclination and allow water to be pulled into your gutters, even if placed straight up and down. MasterShield 2.0 gutter guards are now also incorporating copper. This copper is designed to prevent the growth of moss, lichen, and algae in order to keep your filter from clogging. Copper is also used to thin asphalt roof oils and kill bacteria. We can install MasterShield Gutter Guards on new or existing gutters. The only under-the-shingle micro filter gutter guard with the Shingle-Safe™ back. This type of installation has been approved by four of the nation's largest shingle manufacturers. 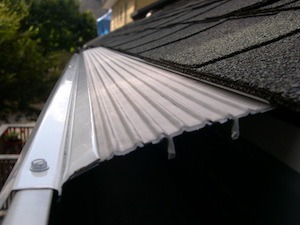 The first gutter guard designed to be pitched with the roof to minimize homeowner maintenance. The only gutter guard with a customizable, flexible back to adjust to multiple types of installations (under the shingle long fin/under the shingle short fin, fascia mounted, hidden hanger mounted). The first gutter guard with a built-in solution to dripping. The only gutter guard capable of filtering water vertically. The first interlocking micro mesh gutter protection system. 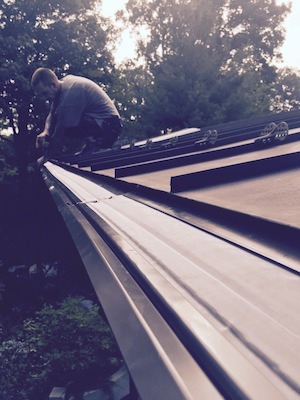 The first roll formed gutter guard to feature built-in I-beams for added strength. Now using copper to prevent moss growth, thin asphalt shingle oils, and kill bacteria. We offer the only multi-patented gutter guard system that requires zero maintenance! We put our money where our mouths are. We are so sure our product works and will be installed to our high standards that we will fix or refund your money if your gutters clog. Period! All other gutter guards still needs cleaning – why would you waste your hard-earned money on old technology? Nothing gets in your gutters but rain water. Guaranteed! What if I also need new gutters? MasterShield Gutter Guards are gutter and water management experts. We will design a total gutter system custom-made to handle the water around your home! Our gutters come in a variety of sizes and styles. If you want new gutters then we can replace your gutters when we install quality gutter guards! If you have issues with clogged gutters or gutters that frequently need to be cleaned, gutter guards could be the solution you need. The gutter experts at MasterShield Gutter Guards can inspect your home and recommend the right products for your needs. If you're interested in gutter guard installation for your home, call us today at 1-844-385-9370 or contact us online to get started. We offer free estimates on all our work in Manassas, Woodbridge, Alexandria, Centreville, Springfield, Annandale, Reston, Chantilly, Burke, Sterling and the nearby areas.